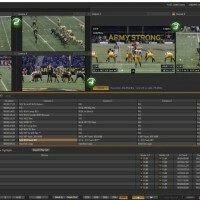 Safe Harbor Computers recently provided some local support for the NewTek 3Play 330 and NewTek 3Play 820 instant replay systems, shown below providing big-screen replay in a live sports venue. These affordable solutions are used by sports broadcasters, teams, leagues, schools, and other organizations to enhance production with portable, and professional, instant replay capabilities. For a more in-depth look at the powerful features available with NewTek 3Play systems, check out the video below, view available solutions, or give us a call and speak with our knowledgeable sales staff at (800) 544-6599.